Home → Learn → UVB Lighting For Frogs: Do They Need It? UVB Lighting For Frogs: Do They Need It? Lighting for amphibians is a subject I’ve been meaning to cover for a while. It’s one of those topics that many people disagree about. Most of the disagreement is about nocturnal species and whether or not they actually need UVB; some sources say they do while others believe they don’t. I’ll do my best to explain both sides but most importantly, I’ll try to present the correct information in a way that’s easy to understand. I usually try to give you, the reader, a short, precise answer at the beginning of a page (in case you don’t have time to read the whole thing). “An answer to what”, you ask? Well, on this page, I’ll be answering the question “Do frogs need UVB light?” Unfortunately, this isn’t an easy topic to summarize in a short answer. Regardless, I’ll do my best to keep my short answer short and to-the-point. The short answer is this; frogs benefit from UVB light whether they’re a nocturnal species or not. Even the small amount of UVB that pierces through a jungle canopy can prove beneficial in boosting Vitamin D3 in reptiles and amphibians. So long as the correct bulb is used and your frogs have places to escape direct light, I recommend it. A 2.0 UVB bulb above their enclosure is great. Position plants and branches strategically to give your frog a place to hide from direct light. Now you’ve read the short answer, I encourage you to check out the rest of the page. I’ll explain why UVB is beneficial to reptiles and amphibians and go into greater detail about the different types of bulbs and light fixtures. Finally, at the end of the page, I’ll tell you what setup I’m using for my Red-Eyed Tree Frog enclosure. UVB or “UV-B” is ultraviolet light with wavelengths between the 290 – 320 nanometer range. 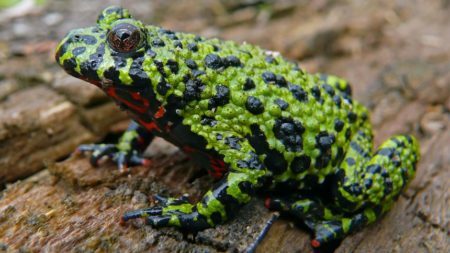 When reptiles and amphibians are exposed to UVB, it allows them to product Vitamin D3. This also helps with the calcium they need in order to have strong bones. Different species require different amounts of exposure; some need to bask in the sun while others can absorb enough UVB in a short amounts of time. Where the confusion and disagreement starts is when you begin discussing nocturnal species. 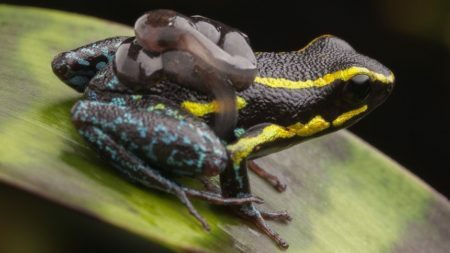 This isn’t unique to frogs, by the way. The same disagreement persists for certain lizard species too. The argument is that because nocturnal species hide and sleep during the day, they don’t require UVB lighting at all. You have to factor in their natural habitat as well. Many of these nocturnal species live in thick jungles where direct sunlight is blocked by numerous trees and plants. Then there are burrowing frogs like Pacman and Tomato frogs; they spend much of their time burrowed under the substrate. Suffice to say, these species aren’t receiving very much UVB at all. This is why there is confusion on whether or not to provide a UVB light for these species in captivity. But the argument can be made that, if they were in their natural habitat, they would be exposed to UVB from the sun, even if it’s just a small amount. And that small amount of UVB plays a role in keeping the frog healthy. 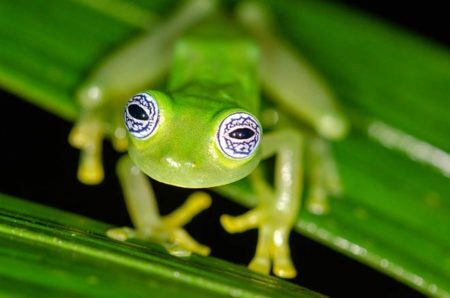 Most people keep exotic frogs as pets because they genuinely like the species and enjoy watching them. For me, not only do I like the frogs themselves but I also enjoy naturalistic setups with live plants and cool looking branches too. It’s the whole package – not just the frog. 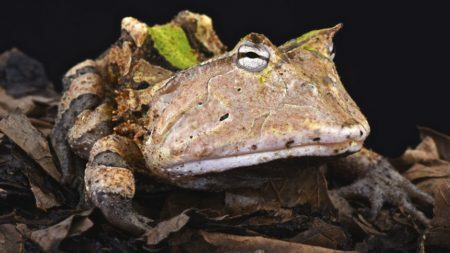 Whether you’re into bioactive terrariums or not, one of the main goals of a herpetologist is to recreate the natural habitat of the inhabitant as best as possible. From the type of food your pet eats to the temperature and humidity, it’s all important in the well-being of your pet frog. Lighting and UVB, in my opinion, fall into this category. Yes, even for nocturnal frogs. If they were in their natural environment out in the wild, they would be exposed to some UVB, even though it’s not much. I didn’t always recommend low-powered UVB lights for amphibians. Truth be told, my Red-Eyed Tree Frogs have gone most of their lives without a UVB light and they’re as healthy as the day I got them. Granted, I feed them gut-loaded crickets dusted with calcium and vitamin supplements but they’re in good shape. The reason I mentioned that is because I don’t want you to think you need to rush out and buy a UVB light right now. 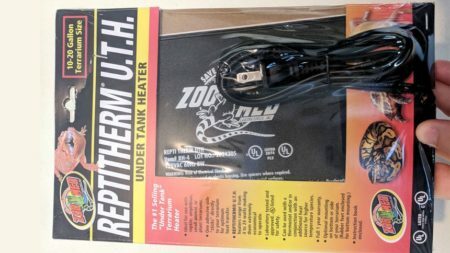 Whether you’re preparing an enclosure for new frogs or you’re wanting to add UVB to your current setup, this section is for you. I’ll talk about the common types of bulbs, what the numbers indicate, and how long you can expect them to last. UVB bulb in the US market come in 2.0, 5.0, and 10.0. For those of you in the UK, I believe your market offers 6.0, 12.0, 14.0 and something similar in comparison to 2.0. The UVB 10.0 bulbs are mostly used for lizards that enjoy basking in the sun. 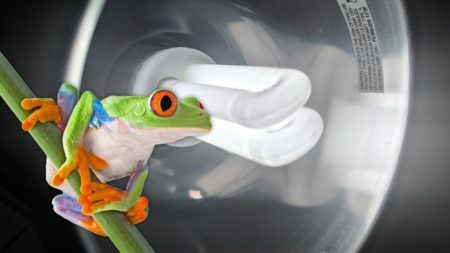 For most frogs, a UVB 2.0 light bulb works well, so long as you provide them with a few places to escape from the light. You can do this by strategically placing branches, plants, and decorations in such a way that creates shaded hiding spots. Now that you’re up to speed on this part, let’s take a look at the different kinds of lights. There are Fluorescent bulbs, Mercury Vapor bulbs, and Metal Halide bulbs. For each type of bulb, there is generally a corresponding “hood” or “dome” fixture in which you plug the bulb into. Hoods and domes are light fixtures – its where you screw in the light bulb. Dome’s typically have a reflective coating on the inside which is supposed to increase the effectiveness of the light. Hoods are more visually appealing and fit nicely on top of your terrarium. Some brands, like Exo Terra, sell hoods designed specifically for their enclosures. UVB bulbs degrade over time which means they gradually stop emitting UVB (even though they’re still producing light). For this reason, you’ll need to replace the bulbs. The list below shows about how long you can expect each type of light bulb to last. 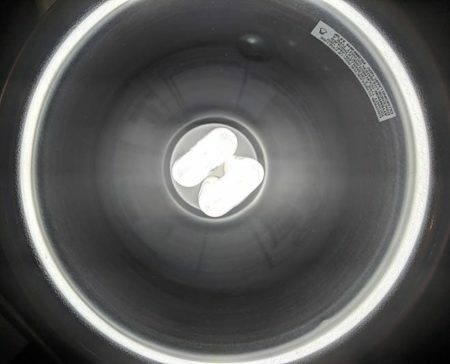 Fluorescent bulbs typically last 6 months. Mercury vapor bulbs can last up to 1 year. Metal Halide bulbs sometimes last up to 2 years. One way to know whether or not your UVB bulb(s) are producing enough UVB to by using a UV Index Meter. Solarmeter is a brand that offers a nice, high-quality meter but they’re not cheap (click here to check the price on Amazon). Without a UV Index Meter, you should consider replacing the bulbs as often as the manufacturer recommends. Last but not least, objects between your amphibian and the UVB bulb will affect how much is received. The same goes with distance. As the bulb is moved farther away, the amount of usable UVB decreases. The best you can do is set the light directly on the top of the terrarium. Be mindful of your frog, though. A hot light fixture can be harmful if your frog gets too close. Glass blocks UVB. If you’re using a glass lid, don’t expect the UVB to go through it! Consider switching to a screen lid instead. Even screen lids decrease the amount of UVB which passes through them but they don’t block it entirely. 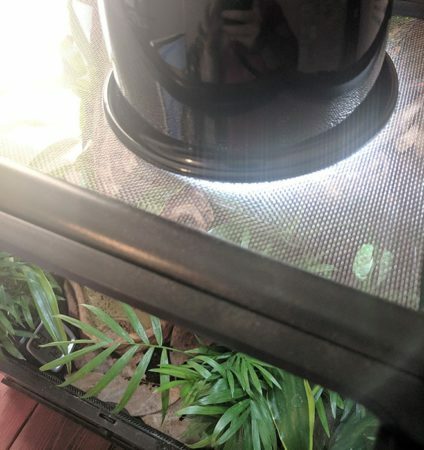 Some companies, like Exo Terra, offer “light hoods” for their terrariums. 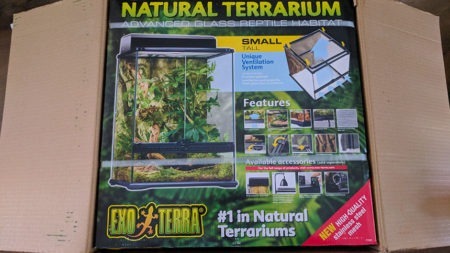 For example, if you have a 12″ x 12″ x 18″ Exo Terra, you can buy a hood that fits directly on the top of your terrarium. If you can’t get a hood or you simply don’t want one, another option is to get a “dome”. Last but not least, of course, is the UVB light bulb. Most name-brand light domes and bulbs are dependable. I haven’t tried them all but I’ll tell you about the one I’m using now. The current setup I have for my Red-Eyed Tree Frog terrarium is a Fluker’s Mini Sun Dome (click here to see it on Amazon) with a low-powered fluorescent UVB bulb. The Exo Terra Repti-Glo 2.0 is a great choice (click here to see it on Amazon). 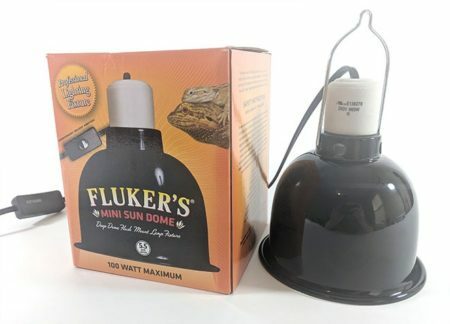 I highly recommend the Fluker’s Mini Sun Dome. It’s small and easy to use. I have mine sitting directly on the screen lid of the terrarium. It comes with a loop so you can hang it on a light stand if you have one. For the light itself, an Exo Terra Repti-Glo 2.0 UVB bulb will fit nicely. By the way, there are lamp stands made specifically for reptile and amphibian enclosures. I personally haven’t tested it but the Blue Spotted Deluxe Lamp Stand looks like the most reliable one. It has a base that slides under the terrarium. Anyway, that’s all for this post. I do hope this information was helpful to you. If you have any questions, feel free to ask in the comment section below.